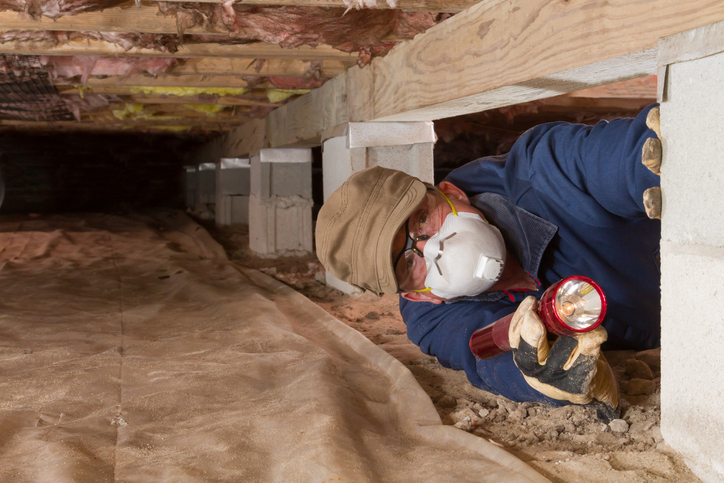 If your Texas home’s crawl space has been “encapsulated”, it might be wasting energy. Find out how easy it is to fix so you can enjoy lower electric bills and increased comfort! How Does Encapsulating Your Crawl Space Save You Money? Does your house have a vented crawl space? If so, then you’re most likely paying for more electricity every month than you should be. If you’re interested in cheaper electricity in Texas, then you need to understand why ventilated crawl spaces are horrible for your home, so you can lower your monthly Texas energy bill. Years ago, home builders believed that ventilated crawl spaces benefitted homes. This is a myth. During the summer, hot, humid air enters the crawl space through the air vents and comes into contact with the cool air beneath the home. This causes condensationto form, which increases humidity and creates the perfect environment for mold to grow. When this free-flowing air comes into contact with the uninsulated areas beneath your home, it interferes with heating and cooling. As a result, your HVAC system must work longer to regulate the temperature in the living area, increasing your Dallas electricity bills. Remove any debris before beginning to help prevent odors and provide a clean surface to begin. Install an effective drainage systemwith a sump pump to help remove any seepage from groundwater. Lay down a 6 mil polyethylene vapor barrieron the floor of the crawl space to further reduce moisture and foul odors. Seal offany outside openings and vents to prevent the humid air from entering into the crawl space. Seal holes and gaps where plumbing and electrical wires enter the living space above. Insulate rim joistsas they can provide several small points of entry for untreated air to enter your home. Installrigid foam boardsalong the interior crawl space walls to further insulate the crawl space and to keep hot/cold air from seeping through the foundation and into your home. Cover the interior crawl space walls with a polyethylene liner to further prevent moisture from entering the space. If you’re comfortable with home projects, it’s possible to buy a DIY kitthat contains the necessary supplies allowing you to encapsulate your crawl space on your own. However, some people find it best to hire professionals as the job can be complicated at times. Professional installation costs between $1,500 and $15,000, depending on the size of the crawl space and type of materials needed. How Much Will I Save After Encapsulating My Crawl Space? By encapsulating your crawl space, you can save up around 15 percent each monthon heating and cooling costs alone. This is because your HVAC system will no longer have to compete with the moisture-laden outside air coming through the crawl space and seeping into your home. It’s effect is so great that if you want to easily lower your Texas electricity bills, then a primary goal should be to encapsulate the crawl space underneath your home. What’s the Easiest Way to Save on Energy Bills? Encapsulation is just one way to save more money on your energy bills each month. Another great way to save is to take advantage of the power to chooseyour electricity provider in Texas. But switching electricity companies isn’t always easy. If you’re looking to shop while Texas energy rates are low, then check out www.TexasElectricityRatings.com. There you’ll find all the help you need to begin making the switch to the best electricity provider today.